By Danielle Stephens | May 8, 2013. A man who set fire to St Catherine’s Church last January has been found not guilty by grounds of insanity. Frank Currie (49) admitted to setting the fire, which caused 4.1m in damages. He proclaimed that he was “God Almighty” and signed his name as “Jesus Christ” when he was being booked into the Garda station. During the trial, the jury heard from Dr Conor O’Neill, who is a consultant psychiatrist at the Central Mental Hospital. He told the court that in his opinion Mr Currie was suffering from a mental illness, which meant he wasn’t able to stop himself from carrying out the arson attack. The case is now adjourned until 10 May, so that a new report assessing Mr Currie’s mental state can be carried out. Mr Currie will be held at the Central Mental Hospital until then. According to one of the parish priests, Fr Niall Coghlan, this was not the first time that there had been an incident involving Mr Currie and the church. About three weeks before Christmas, the homeless man caused a disturbance by shouting at people during Sunday mass. He stole one of the vestments that the priests wear when saying mass. Nothing was done about the incident at the time and there wasn’t any sign of Mr Currie for a few weeks. However, Fr Coghlan explained that Mr Currie returned on the morning that the fire took place. He wasn’t wearing any shoes and asked the sacristan if he could get some shoes. Fr Coghlan subsequently gave him a pair of his own boots and he went away. Fr Coghlan went to meet friends after saying 10 o’clock mass and when he returned home at about 4pm, he was met on Thomas Street by a parishioner, who told him that the church was on fire. CCTV footage shows that Mr Currie was alone in the church, when he suddenly got up and started rearranging the church statues. Fr Coghlan said that it wasn’t unusual for parishioners or homeless people to be left alone in the church: “Sometimes people come in to sleep and for heat, and we don’t mind that because it is as much their church as it is ours,” he said. Most of the damage was caused by an explosion that lasted for about 30 seconds. Flammable fumes that had reached the apex of the church met with oxygen when the firemen entered the building. The explosion travelled the length of the church, destroying the mural on the ceiling. It also blew out the stained glass window at the front of the church as well as incinerating the organ. The insurance company were able to cover most of the costs, but some of the restorations needed weren’t covered because they were not directly damaged by the fire. The exact amount of money needed is not yet known because some of the costs are still coming in. However, Fr Coghlan estimated that it is somewhere in excess of €150,000. A fundraising committee was set up at the end of last year in an attempt to raise the money needed to open the church. So far their efforts have been successful and they have collected around €190,000. The committee comprises of the two priests of the Augustinian Church; John Laurence, who owns a shop on Thomas Street; Noel Fleming of Meath Street; businessman Tommy Daly and parishioner Anne Mooney. Each member had their own reasons for getting involved with the fundraising effort. Anne Mooney has been a member of the parish for her whole life and said that when the fire happened, it was as if the heart was gone out of the street. She explained that there was no real effort needed in organising events, “People just wanted their church back, so they just went in and gave what they could,” she said. Noel Fleming and John Laurence, who own Londis on Meath Street and Black Bow on Thomas Street respectively, said that from the start, they would do anything they could to help. However, Mr Laurence believes that he should have known that what he had done was wrong and that there should have been a stronger punishment enforced. The fundraising committee have collected money from sponsored greyhound races, pigeon races and putting donation boxes into shops in the area. 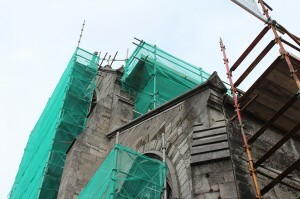 They also started a campaign to help pay for the 25,410 slates needed for the roof. Anyone can come in and sponsor a slate for €5, giving them the opportunity to personally have a stake in the renovated church. The goal is to have the church open by July or August and things like the new stained glass windows and the new organ are expected to be put in sometime in the following months.